Presented by global music collaborationist extraordinaire Jah Wobble, the Pagoda Chinese Youth Orchestra and Liverpool Signing Choir come together in a fusion of Chinese folk, dub, grime and reggae. Six years ago, Jah Wobble’s Chinese Dub enthralled audiences all over the UK with its hugely successful fusion of Eastern and Western music and dance. 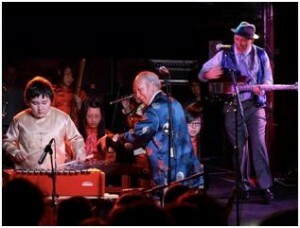 Inspired by this unique project, the Pagoda Chinese Youth Orchestra worked with Jah Wobble to create Jasmine Flower Fusion, an unprecedented mix of Chinese folk song and grime. Little did Jah Wobble realise that this acorn project would continue to grow and thrive, and five years on, he returns to witness the progress of the youth orchestra, leading the evening performance with award winning songs from Chinese Dub, Jasmine Flower and something new to the young people – Reggae! The International Festival For Business, hosted in Liverpool this year, is funding Jasmine Flower Fusion. Liverpool’s Resonate Music Education Hub and Our Big Gig, a national celebration of music are also at the heart of the event as Jah Wobble and the Pagoda Youth Orchestra invite the public to join them in the creation of Chinese Music. The workshop, to be held at the Pagoda Arts Centre, Liverpool runs on July 12th from 2-3pm where people are invited to learn how to make Chinese music on Western instruments and try some of the Chinese instruments for themselves. The evening performance, also at the Pagoda Arts Centre, begins at 7.30pm. Tickets for each event are £10, admittance to both events costs £15. Commenting on the performance, Jah Wobble promises “a heady brew of East-West fusion as Chinese music gets the dub treatment”.